ey West is probably the best-known small town on the planet. Though tiny enough it is rumored to fit into New York's Central Park, Key West has managed through its rich history, its remote location and its ravishing natural beauty to earn a notation in every national and international map. 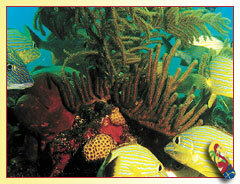 Key West sits like a jewel in the middle of the sea, just off the coast of America. Its air quality is second to no other city. The average annual temperature of 77 degrees rarely varies more than 10 degrees in either direction, with a record low of 41 degrees and a record high of 97 degrees. It has never seen frost or snow. 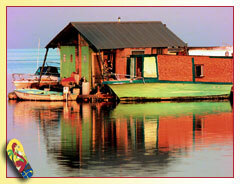 Perennially sunny, the island average only 39 inches of rain per year. Although Key West is, in fact, the westernmost of the Florida Keys, its name was corrupted from the Spanish Cayo Hueso or "Island of Bones," dubbed such when Spanish explorers set foot on a landscape littered with the human bones of Calusa Indians and unfortunate seafarers. Of late, it has also been nicknamed "The Conch Republic" and "Margaritaville," (as much a state of mind as it is a comment on one of the daily rituals). There's no up-town or down-town in Key West, no dress codes even for the finest of restaurants. Tolerance is the rule and differences are to be celebrated. Even daily life in Key West includes a certain off-beat sense of celebration. Each day's setting sun is celebrated and sometimes even applauded at Mallory Square , while artisans, musicians, and street performers pack the city pier with visitors as the famed and often glorious Key West sunsets shimmer over the Gulf of Mexico. 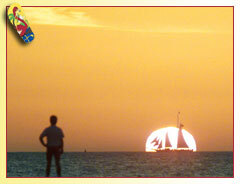 Key West is a city which celebrates itself, its history, its diversity and its various reputations in many ways. Festivals and parties punctuate the tourist season. The social calendar, fishing tournaments and art festivals, literary seminars and world premiere plays, house and garden tours, international power boat and yacht races, and a lighted boat parade goes on 365 days a year. 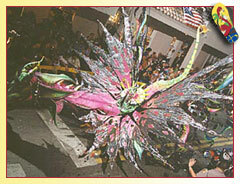 Most notable perhaps is Fantasy Fest, Key West's answer to Mardi Gras. Visitors from around the world descent on a ten-day event in October that culminates with a parade through Old Town that draws an estimated 50,000 celebrants. Key West is for many the greatest city in America. Its population is a patchwork quilt of the most culturally diverse elements imaginable, stitched together with the sturdy threads of acceptance and the desire to celebrate life.